This is very sad and poignant but beautiful in a way too, so thought Id share. It was a young boy's private moment of grief, but it has caught the attention of strangers across the world. Luke Wise's mother snapped a photo of him as he sat curled up in a corner next to a photo of his soldier father, who was killed in Afghanistan four months earlier. 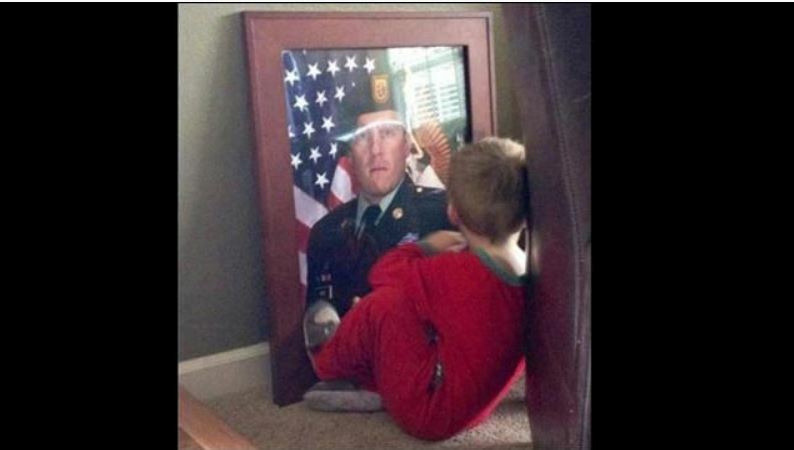 "Found my son sitting having a moment with his daddy (SFC Benjamin Wise) the other day," Traci Wise wrote on Facebook. "We lost him January 15 in Afghanistan…we cannot forget about the incredible loss these children must undertake." The heartbreaking photo, which has been shared more than 11,000 times, has provoked an emotional response on online forum Reddit. Reddit user TheMacMan posted it with the caption, "His mom caught him spending time with his daddy". "I'm not usually too choked up on reddit but this really hit me hard," one user posted. "Knowing soldiers are killed every day and leave children behind is heartbreaking," another wrote. The boy's father, who was part of a Special Forces group, was aged 34 when he was killed on his fourth deployment to Afghanistan. It is heartbreaking, this soldier had 4 tours so don't know how much time he spent with his child, maybe he is indeed evoking memories by looking at his Daddys picture.